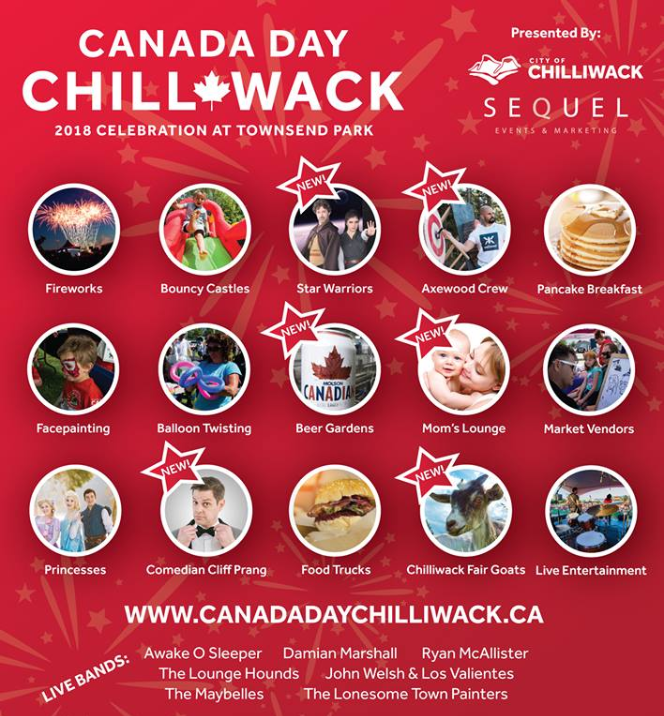 Chilliwack – Celebrate Canada Day at Townsend Park on Sunday July 1st, 2018! Festivities kick off with the Kiwanis Club’s annual $5 Pancake Breakfast from 8-11 am at Evergreen Hall. Continue the fun from 11am – 4pm with family and children’s entertainment, activities and food. Free Face Painting, Balloon Twisting & Bouncy Castles. Evening ceremonies start at 5pm with Live Bands & Fireworks ending the night. Enjoy local community group displays, stage performances, vendor market, food trucks, Axewood Crew axe throwing, Molson Coors Fraser Valley Brewery – Chilliwack & Frankie’s Italian Kitchen & Bar – Chilliwack Beer Garden, Yellow Bird Birth Doulas Moms Lounge, Live Music, Fireworks Finale & more! For more information – the website can be found here. The Facebook page info can be found here. Be the first to comment on "2018 Canada Day – July 1 In Chilliwack"